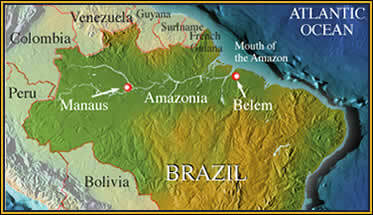 Location: Ilha Marajo in the Mouth of the Amazon is the size of Switzerland. There are three species of anacondas, the wide-spread common green anaconda (Eunectes murinus), which occurs throughout the Amazonian and Orinoco river systems, the yellow anaconda (E.notaeus) from southern Brazil, Paraguay and northern Argentina, and the rare and little known de Schauensee’s anaconda from the Ilha Marajo in the mouth of the Amazon. Mark O’Shea has always wanted to visit the huge island of Marajo, an island the size of Switzerland and the largest island in the Amazon river mouth where the opposite banks are 200 miles apart or the distance from London to Paris. It has been his long term aim to capture one of these poorly documented anacondas and compare it with a green anaconda from the same area. How and why do they differ? How can two species of anaconda co-exist in the same flooded savannas and watercourses? And how big can they grow? 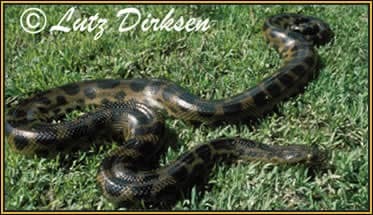 A close view of a De Schauensee’s anaconda (Eunectes deschauenseei), the head is similar to that of the yellow anaconda (E.notaeus).